Martha and I simultaneously stopped everything we were doing and stared blankly at this woman for a few moments, not really understanding WHY someone would want to kill dandelions OR pump poison in their yard. My multi-tasking came to a screaching halt as I anticipated Martha’s answer, fingers held hovering above the keyboard. “Perhaps you should make some dandelion wine, or a nice green salad with the tender leaves instead of poisoning your yard with herbicides…” I proudly watched my mentor respond. Oh how I love Martha Stewart! I can’t tell you how happy it made me to see a popular figure on television advocating for the herbs that grow around us. Yes, people dandelions are an herb. Not a weed. The difference is that herbs serve a purpose. Weeds do not. Many things we think of as “weeds” are indeed actually “herbs” once you make friends with them. 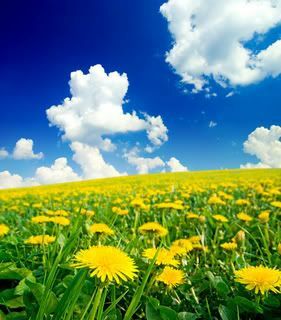 In my mind there is no herb more glorious than the dandelion. No flower more beautiful. Nothing more magical or miraculous. Any rose can be beautiful with enough fertilizer, weed killer, manual aphid plucking, and diligent daily watering. But, frankly I have a tough time respecting something so persnickety. I admire a flower with the tenacity to grow through a crack in the pavement and still come out bright yellow and full of sunshine. Dandelions also refuse to be cut flowers. They will not play that game, they will not sit in a vase for you and look pretty. You have to enjoy them on their terms. What they will do for you though is provide you with an invaluable source of free medicine. Dandelions cleanse your liver, lower your blood pressure, rejuvenate you for spring, reduce water retention and blood pressure through their diuretic mechanism, improve digestion and nourish you with potassium, vitamin K, and minerals. Did you know you had such an AMAZING medicine growing right in your backyard? If your yard is organic you can pick some of the fresh green leaves and add them to a salad. Bitter greens stimulate our digestion as they hit the bitter receptors at the back of our tongue which are innervated by the vagus nerve. The vagus nerve moves bile (and thus toxins) through our livers as well as stimulates the peristaltic activity that moves the digestive process along. Bitters are imperative for those with sluggish digestion and constipation. America is a sweet tooth culture and the best thing we can do is balance out all that sweet with some bitter. A nice bitter salad before dinner is great for getting the digestive juices flowing. You can add some fresh flowers as garnish. Just pick them right before serving so they aren’t wilty. The entire plant is full of medicine. The leaves of Taraxicum officinale lower blood pressure. Most diuretic anti-hypertensives deplete potassium stores, but dandelion comes conveniently packaged with potassium! Now mild cases of hypertension and edema will respond to this plant, but more moderate and severe cases will most likely need a stronger herb. The root of the plant can be dug up in the fall and used as a liver tonic. So if you REALLY want less dandelions in your yard then just harvest them every fall, or just call me up and I’ll come by and get them for you. I guess that is the best way to get rid of the dandelions…use them up! Chances are if they are growing in your yard, you probably need them. I take a green vibrance drink every morning with a high quality cod liver oil mixed in (mmm, yummy) and 100mgs of super absorb COQ10. Am I covering most of the mid 40something bases and what are the best anti-carcinogenic herbs? Did you see the cunning way I sneaked two questions in there? I like your thinking. Actually I have already been answering peoples questions as the two posts below this are recent questions I’ve received. I am impressed with your green drinks, fish oil and coQ10 that is a great preventative measure! I’ve also found that if you add few leaves to the morning tea before taking shower, it helps with indigestion and probably cleanse toxins from the body. Great post as usual. i like dandelion too . I’m with Erin on this one. Our dogs have free reign in our yard, (and some of the neighbor dogs as well), so I’ll have to pass on eating the dandelions that are currently growing, and being naturally fertilized. However, I do remember my grandmother making dandelion wine. I’m totally fascinated by this post Dr. Nicole! Coming from an Italian family my grandmother and dad loved serving up dandilions. They always said it was healthy. I generally don’t like bitter salads but you’re turning me around here. Thanks! I love your post Dr. Nicole, let’s hope it encourages more people to think green and use what Mother Nature provides. Ameo- I like her show because it is not just about food it is also about craft projects! Barbara- yes dogs in the yard are not a great idea, for gardening or for edible herbs! I’ve never tried dandelion wine…I would be curious, I am not sure if the blossoms are used or the whole plant. Hi Mark- glad you liked the post! Most Americans don’t like bitter salads. It is natural to not like the bitter flavor as most poisonous substances are bitter so we are hardwired to avoid them…but including a little bit of healthy bitters here and there is a great idea! Hi Jess- thanks for stopping by! I hope more people will be encouraged as well to experiment with “weeds” and turn them in to “herbs”. I love our dandelions (my neighbors don’t) and I kept them in our yard b/c I heard that the bees needed them but I am going to try some of these. You are so helpful! Great post! We have an abundance of dandelions in our yard, and we were thinking that we should use them, but weren’t sure what to do. Thanks for the suggestions! Hi Heidi- You are such a sweetheart to be worried about the bees! Thanks Mary- Be sure to use the tender new leaves of the dandelions, not the old tough ones! Arthritis: Glucosamine, Chondroitin, or MSM? Why Does My Eye Twitch? Why Do I Get Leg Cramps?